One of our favourite things about winter is … it means soup season is here! One of our favourite things about winter is … it means soup season is here! It's almost soup season - time to stir the pot. One of our favourite things about cooler weather is … it means soup season is here! So many recipes, and it’s so easy to throw together your favourite ingredients, or whatever’s left over in the fridge. 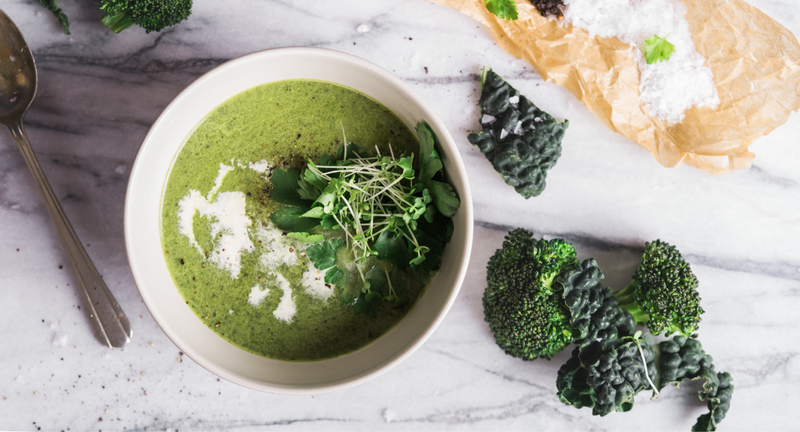 Here’s a soup that we know you’ll love, because it’s full of so many good things, but mainly, cauliflower and broccoli, which have a very special anti-oxidant called CoQ10. According to mindbodygreen.com, researchers think CoQ10 can help with conditions like heart disease, immune function, diabetes, cognition, and even migraines because of its antioxidant activity, effect on energy production, and ability to prevent blood clots. So this recipe for creamy broccoli and cauli soup with kale and toasted pumpkin seeds is also medicine – and it won’t need a spoonful of sugar. Creamy Broccoli and Cauli Soup with Kale and Toasted Pumpkin Seeds. So many recipes, and it’s so easy to throw together your favourite ingredients, or whatever’s left over in the fridge. In a pot on medium heat, sauté the chopped onion and garlic in 2 – 3 tbsp olive oil and a knob of butter – for 2 – 3 minutes. Bring to the boil, and then simmer on a medium-low heat for 20 minutes. While simmering, toast the pumpkin seeds in a dry pan. Toss the chopped kale in olive oil and roast on a baking tray for 20 minutes. It should be crispy, and crumble easily. Remove the soup from heat and mix in the crumbled cheese, stirring to blend it in. Serve in bowls, and top with the crushed kale and a sprinkling of pumpkin seeds. If you don’t use cheese you can use a dash of cream or double cream yoghurt.